My first class of the day is Forage Crop Managment. So far we have covered pasture establishment and renovation, nutritive value of forages for ruminant livestock, and identification of these forages. Today, we are talking about production of hay, specifically proper curing of hay before baleing it up. Many of you may know that hay production is in short supply around Missouri this year due to the drought this past summer. Fortunately, many farmers were able to get a second cutting of hay off their fields this fall. 🌾🌾🌾 I grew up on a cow/calf operation, and spent my summers during high school on a tractor mowing, raking and baleing hay, so hay production has always intrigued me. This is my favorite class this semester, as it gives insight on a sector of plant production that is different than crop production. 🌾🌾🌾 Charlie Ebbesmeyer is taking over our Instagram page for our #TakeoverTuesday 🌾🌾🌾 Charlie is from Fayette, Missouri and is currently a senior at the University of Missouri where he is studying Plant Sciences. Upon graduation he will work for MFA Inc. as a crop consultant in the central Missouri region. Follow along for election day excitement and to get a glimpse into Collegiate Farm Bureau life! I voted! I am proud to be from a country that allows me to vote for those who will represent me at the local, state and national level. When I was young I would follow my parents to the polls and watch them vote and I couldn’t wait until I was old enough to vote! As soon as I turned 18, I started voting and have never missed an opportunity to practice my right to vote! Why do you vote?—— Charlie Ebbesmeyer is taking over our Instagram for our #TakeoverTuesday today!—— Charlie is from Fayette, Missouri and is currently a senior at the University of Missouri where he is studying Plant Sciences. Upon graduation he will work for MFA Inc. as a crop consultant in the central Missouri region. Follow along for election day excitement and to get a glimpse into Collegiate Farm Bureau life! We were pleased to be joined by Connie Haden of Haden & Haden Law Firm at our Nov. Collegiate Farm Bureau meeting. She spoke to us about Estate Planning and local County Health Ordinances across the state.——We then discussed upcoming events, specifically Farm Fourm. This year we will be discussing the mis-labeling of products such as milk, GMO’s and fake meat. So mark your calendars for Nov. 29th. The discussion starts at 7pm, but we will be having a networking hour before, so show up at 6pm to network with industry professionals!——Charlie Ebbesmeyer is taking over our Instagram for our #TakeoverTuesday today!—— Charlie is from Fayette, Missouri and is currently a senior at the University of Missouri where he is studying Plant Sciences. Upon graduation he will work for MFA Inc. as a crop consultant in the central Missouri region. 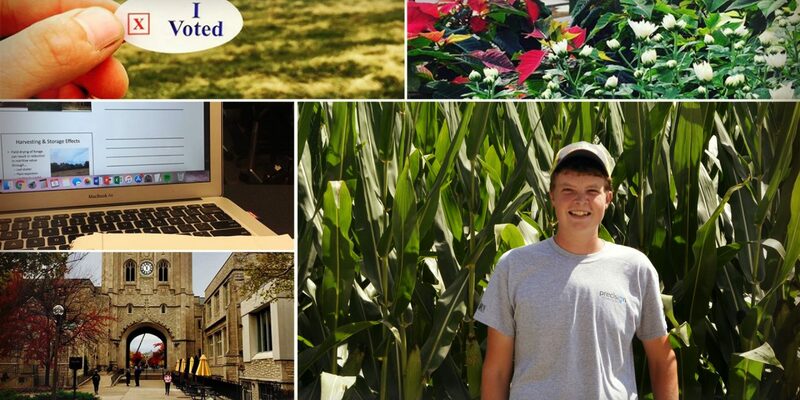 Follow along for election day excitement and to get a glimpse into Collegiate Farm Bureau life!